"Excuse me while I turn my back for a second." "Look at my pretty buttons!" "I'm ready for my close-up, Mr. DeMille..."
Yarn - 6 skeins of the new Cotton Ease is "Almond." Mods - I made the body 4" longer and the sleeves 6" shorter. I can't say enough about the new CE. Just like the old CE but in lovely, grown-up colors. 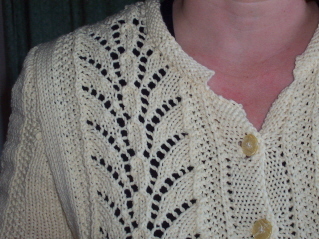 It was a dream to knit - soft & forgiving. There were (gasp!) NO errors in the pattern. I was using light worsted yarn instead of the DK called for in the pattern, so I knit the size 38 to get a 42 and it was spot on for size. I think I need to rest on something...where DID I put those laurels?????? Yesterday we watched two films, Lady In The Water (from Netflix) and Firewall on HBO. Of the two, "Lady" is a much better film. Although I love Harrison Ford, this film is so generic it lost me a quarter of the way in. He displays emotion but it's mostly over-the-top anger - no subtlety here! I'll admit, however, that the fight scene at the end was one of the grittiest I've seen. Talk about slugging it out! On the flip side, I'd recommend "Lady" if you're looking for something different. I was expecting to either love the film (ie. "The Sixth Sense") or hate it (don't get me started on "The Village!") but remarkably I landed somewhere in the middle. It wasn't what I was expecting - we'd deliberately not read reviews - and the adult fairy-tale aspect was intriguing. M. Night Shyamalan had originally written the story as a bedtime story for his children but, of course, his fairy-tales are twisted! I enjoyed all the different characters and how they fit into the grand scheme and it was fun watching Shyamalan in the middle of it all. The kids were a little disappointed, though, since we'd seen the movie trailers in the theater and were expecting something scarier. And I think we were all expecting a little something more at the end. I'd like the sleeves to come to the bend of my elbow naturally - no pushing required. That's probably on my mind because I wore Nantucket last week and really enjoyed the sleeve length - not too long, not too short. :) I think I'll hold a Fountain sleeve up to a Nantucket sleeve & go from there. If I'm stopping soon, I'll need to step up the increases accordingly! 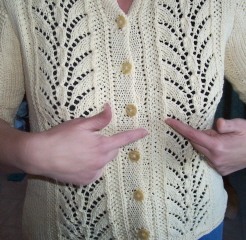 Either way, you just might be seeing a finished cardi sometime Monday. 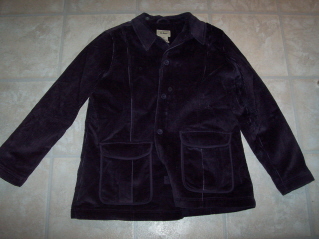 :) I'm going to mosey out today & see if I can find some off-white buttons to match. 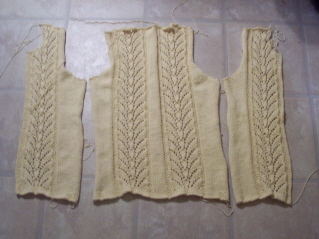 ::grin:: I can't wait to have this one finished - I really think I'm going to love it! Now - on to that Weight Watchers bit. I don't know what it is - whether after 2 years I lost a little of my "oomph", a little of my drive, or what, but these final pounds are proving difficult...especially since I gained 10 of them back over Christmas! I tried counting calories as I was doing before the holidays and for 2 weeks, nothing happened. I finally decided I'd had enough with dicking around (so to speak) and on impulse I pulled up Weight Watchers Online & signed up for 3 months. For $65, someone else is telling me how much to eat (although not what to eat - I'm doing the Flex plan, not Core) and so far I love it. I enter everything I eat and am planning to eat into the Tracker and everything is figured for me - no mess, no fuss, no strain. 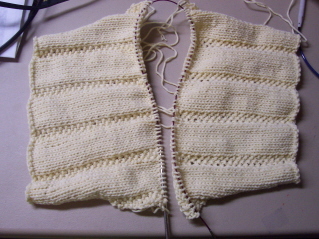 The sleeves will go fast with just stockinette & seed stitch to contend with. :) I'm hoping to have them done by Monday - we'll see! At least it runs smooth as silk now! I forgot to tell you that I wore Nantucket to school the other day. No comments at all, although I saw "the" teacher three times. However, I loved wearing it and that's what counts, even if no-one else notices! Weekend weather report: Looks like the storm stayed north of us so all we're getting now is rain. Yesterday was a huge melt day for us - we're finally starting to see the ground again! 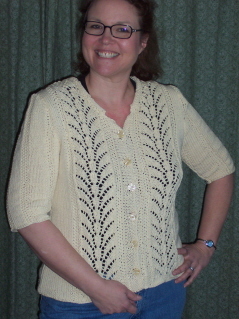 That's it for now although I need to apologize in advance: I'm going to be going back & putting the posts relating to Fountain Lace Cardi in the new category I've made so those of you with Bloglines or other news readers may see this post pop up over & over again as Typepad republishes. Although just barely. Last night, for the first time in months, I had one of those "fall asleep for 3 hours, then wake-up with insomnia for 3 or 4 hours, then crash for another two before the alarm goes off" nights. I hate that. It's not something you can take a pill for since you can't predict when it will happen and when it DOES happen, there usually isn't enough time until morning to TAKE a sleeping pill & sleep it off. Blech. Send me some stay-awake vibes today, ok? I have a full day subbing & then the meeting with out financial adviser at 4 and I'm already yawning! Dylan actually wrote me a note telling what had happened & left it for me to find when I woke up. :) He's a good kid & accidents happen. (He was taking a drink and it went down the wrong way. He coughed & the rest is history!) It's not like keyboards are $50 any more either. ;) However, we ARE limiting beverages in proximity to the computer! So I think this new coat needs a new scarf and hat to go with, don't you? I'll be designing some sort of cabled scarf & hat set - details to follow! 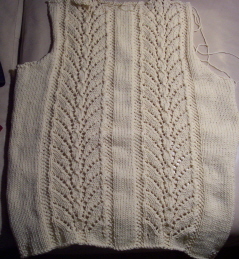 I might need to rip & redo the neckline shaping since I started about an inch or so later than the pattern stated. I'm not sure if it will be too high or not after the band is knit. I've got about 4" complete on the right front & will take that to school today in case I get my two hour lunch/prep period. I'm subbing for Dylan's gifted class so at least I know what to expect! And you HAVE to go with the flow or you'll be crushed & left by the wayside. So - instead of being able to take our time and start looking for a house for us first, we'll be spending the month of February renovating. ::big sigh:: It's really thrown us for a loop and made everything more immediate. As in, we need to get crackin' right NOW on all this house selling, house renting, house buying crap! Just had to vent - on to fibery stuff. 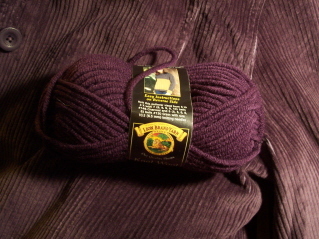 If I want to make a purple sweater, I can look for the yarn in one small area (comparing the different shades & weights), rather than hunting through 4 shelves of yarn! 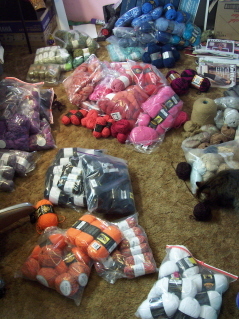 Most of these are the result of various swaps (remember that box of yarn that went traveling with people taking out & putting back in?) and Secret Pal endeavors - too nice to give away. I'm going to make January "little scarf" month here at Casa De Bron and knit each of those up into some sort of lacey something. 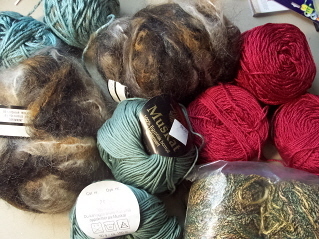 The mohair will be something for Bio-Mom - those are exactly her colors. The rest I'll either keep (that hot pink at the top is extremely cool!) or put in my "to-gift" box. It'll also give me a chance to try out some different lace patterns. "Yay!" 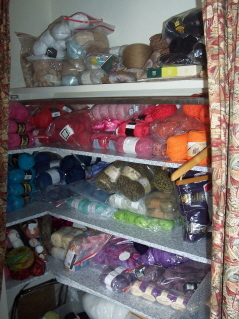 for me for using stash! To anyone who can find the pattern booklet, I highly recommend it! I think I'll take tomorrow off. :) Monday school starts again, although I'm not sure if I'll have a job or not. In fact, right now I just have one job next week - Tuesday from 11:15 to 3:05. I might be at home more often than not since 1. This is the first week of the 3rd nine weeks and 2. the teachers are getting a late start after having 3 snow days. It would really have to be a sickness type emergency for a teacher to be gone right now. So - we'll see! However, both are cardis. 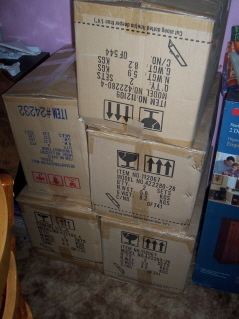 Yes - I realize I vowed to branch out in 2007, but cardis to me are like crack and I must wean myself slowly. Going cold turkey could kill! I managed about 9" while watching the Twilight Zone marathon and The Notebook yesterday. 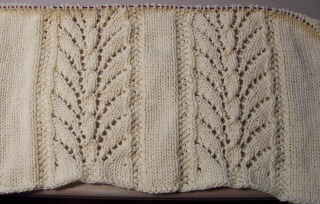 Well - I knit through the first part of "The Notebook." 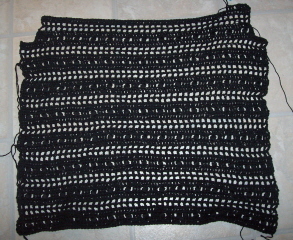 I was crying my eyes out during the last half hour of the film so I didn't dare try to knit! Yes, I could see the ending coming a mile away but that didn't stop me from being suckered into the romance of it all. The critics hated it but I don't care. LOL Besides, James Garner is one of my favorite actors. I'd watch him read the phone book. There looks like there's a sleeve cap in the photo, but in reality there isn't much of one. It's straight decreasing at the top with no real shaping so I should be able to alter as needed without too much trouble. Now, believe it or not, I've been panicking a bit. I've got these two projects on the hook & needles, I have the tree skirt waiting for yarn and my mysterious lace project floating in the ether. But that's it! I'm used to have a stack of things I want to get to but I decided to start the new year clean. This was NOT a good decision for my crafting peace of mind! 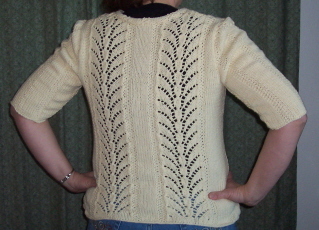 After all, that lace cardi will be finished awfully quickly - I need something else in the queue! Luckily, Amy saved me. 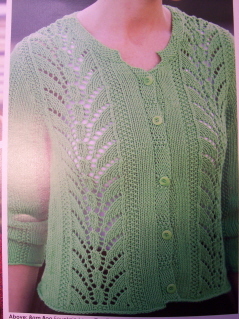 Check out her pattern in the new issue of Magknits. "Holey Cable!" looks terrific. :) Interesting construction, advanced designation...and a designer that's just one panic email away. What more could you ask? So - here's the question of the hour. What's the must-make project of 2007? 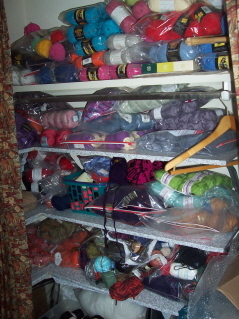 What have you seen out in blogland that makes you want to grab your needles or hooks and start? What pattern would you love to have an "along" for, if only you knew enough people? What have you seen that's cute, chic, and most of all, clever? I'll be searching the blogs too & reporting back. I want 2007 to be, above all, interesting and (dang it) different!